How Can I Legally Protect Everyone From Having an Accident on My Property? Home » The Law & You » How Can I Legally Protect Everyone From Having an Accident on My Property? After a near drowning on her property, a viewer is nervous about something may happen in the future. Is there something she can do to protect her guests and herself? 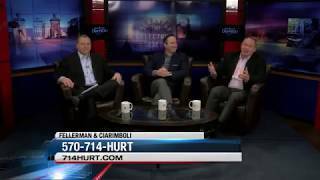 Personal injury lawyers Greg Fellerman and Ed Ciarimboli offer some legal advice. Dave Kuharchik: It’s time once again for ‘The Law & You.” We’re talking about a situation near Harvey’s Lake today. Joining us as always attorneys Greg Fellerman and Ed Ciarimboli. Thanks for being here tonight. Ed Ciarimboli: It’s Greg’s favorite place. Greg Fellerman: I like the lake. Dave: We’ve got to talk some safety. Greg: Some serious stuff here. What is it? Dave: It is. Let’s get to it. Arena in Harvey’s Lake says, “In the summer, my daughters have friends over at the lake. Last year, one of her friends almost drowned. It was pretty scary. It got me thinking what should I do to better protect my guests and myself?” What should people going out to the lake, when we get back to the summer season, think about? Greg: Well, PFDs, flotation devices. Ed: You’ve got to make sure that your boat was properly equipped. Everybody, if they’re going on a jet ski, they have a license to drive the jet ski. Use common sense. If somebody almost drowned, you didn’t give us all the details, I would think you need to be a little more vigilant in making sure people who can’t swim aren’t getting in the water. Greg: Water safety is important. The other thing is, from your perspective as a homeowner and your having guests, you may want to consider taking over your insurance policies. Make sure you maybe have an umbrella policy just to protect yourself. Make sure your entire property’s covered including your house, your boat house. There’s a lot of different issues regarding the lake and water safety. Thank God everything worked out okay. It’s a good time to always take look at your procedures and protocols on how you handle your guests when they come over. Dave: Those are your options. Greg: They have a pool. They have a great pool. Dave: You can either call them or check them out online if you need some help. Results matter with attorneys Greg Fellerman and Ed Ciarimboli. We’ll see you guys next time.